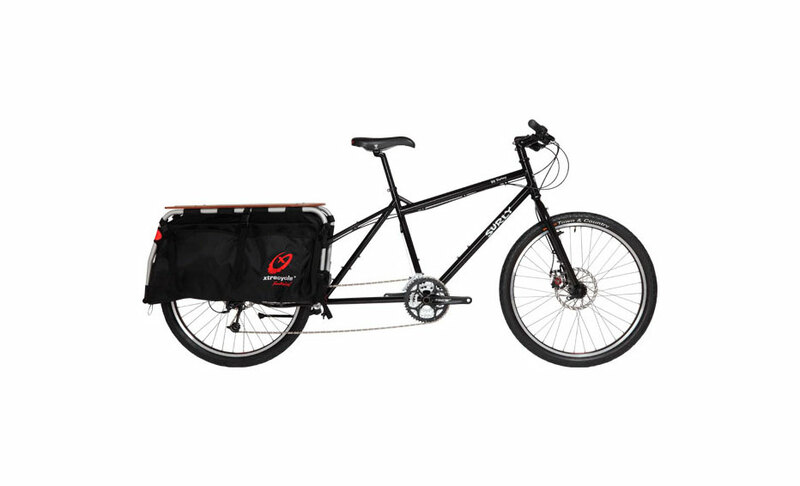 - The Big Dummy is designed for carrying cargo. Like all our frames, it’s made of steel and it’s got lots of little touches that you’ve come to love in a Surly, like clearance for bigger tires and common component sizing. - It’s built around the Xtracycle design platform, which means that Xtracycle accessories can be added depending on what you want to carry, or you can build your own to meet whatever hauling need you have. However, being a dedicated single-piece frame instead of an add-on to an existing bike, it’s more stout and resistant to torsional flex, and this makes it resistant to fatigue and failure. - Figure on being able to carry about 200 pounds (90kg) of cargo. The load weight, and how it’s loaded, will affect the handling somewhat. Also plan on using gears, especially as cargo weight increases. This may seem obvious, but as you get comfy with it you’ll use your full range of gears as never before. - One of the funny things about the Big Dummy is that it doesn’t ride quite like you might think. Sure, it’s a little longer, but mainly it rides like a bike. It’s smooth, maneuverable, even nimble. Are you riding light and want to hit some singletrack on the way home? Do it. And if you get a call from your better half asking you to pick up some groceries, or you see a nice lamp at a garage sale, you’re all ready. Lots of people bought one to use once in a while and began using it as their everyday ride. - The frame can be built up lots of different ways to suit your needs and budget. The complete bike option has been reconfigured this year to help keep the price down while still retaining durable, quality components Surly is known for.